The puzzling title of this effervescent, six-painting exhibition “WTC, WWIII, Couch Size,” refers to the World Trade Center attacks, the various wars going on around the world since, and the idea of painting as a decorative commodity suitable for the collector’s over-the-sofa display. On their own, Ms. Williams’s works don’t bring to mind such topics. 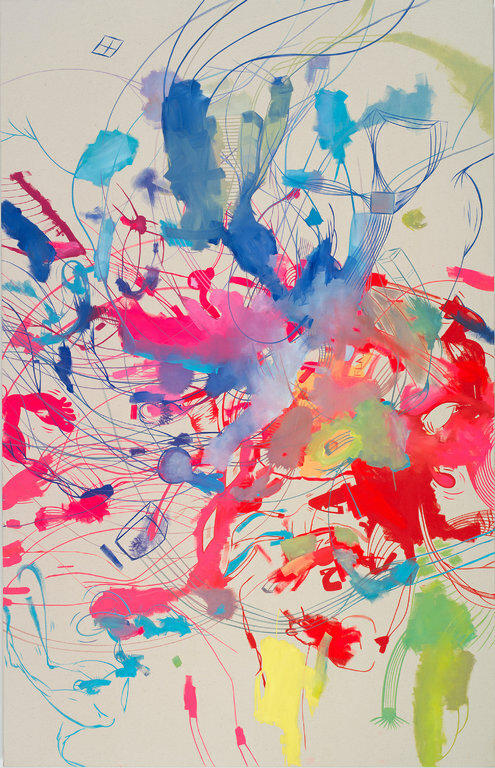 Painting with Crayola-bright colors and spontaneous verve on unprimed canvases up to 11 feet wide, she has created mostly abstract compositions of swerving lines and brushy fields peppered with crisply delineated cartoonish fragments: some organic, some geometric. Here and there, you see sketchy parts resembling gridded office buildings, but without the exhibition title, you wouldn’t think of the twin towers. Ms. Williams leaves much canvas unpainted, so the pictures look like big doodles. Because there’s hardly any corrective overpainting, they have a bracing transparency. You can see almost every move she makes from start to finish. She paints like an improvising jazz musician. Given the infectious buoyancy she generates, titles of individual works like “Ministry of Hate” and “Hill and Dale, Black-Ops” are confounding. Could it be that she adds them out of fear the paintings otherwise will appear irrelevant in a time when art is routinely judged according to political and ethical criteria? If she really wants to convey thoughts and feelings about terrorism and capitalism, she probably needs more explicit imagery and a darker palette. Whatever the case may be, these paintings are scrumptious confections of painterly panache.